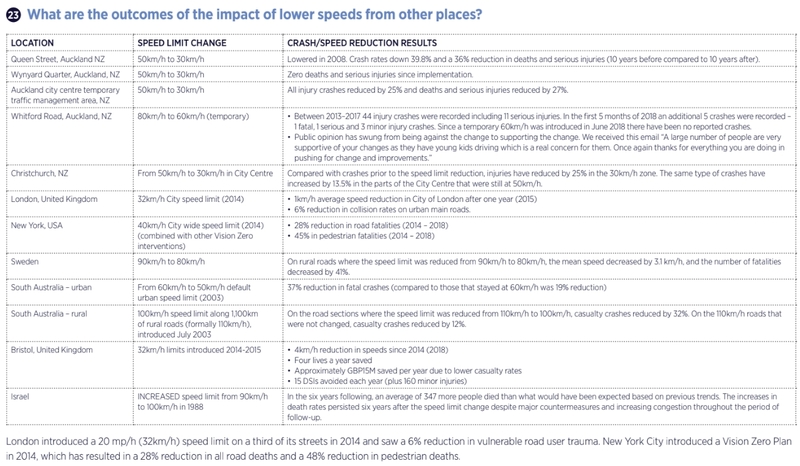 One of the most important tasks Auckland Transport have is to improve road safety. This is even more so because we’re in the middle of a road safety crisis where between 2014 and 2017, the number of deaths on Auckland roads increased by a staggering 78% to 64, a bigger increase than seen elsewhere in the country (which is has also been increasing). But it’s not just people dying, increasing numbers of people are also being seriously injured on our roads and in 2017 that number reached 749. Again, this increased at a higher rate than the rest of the country. 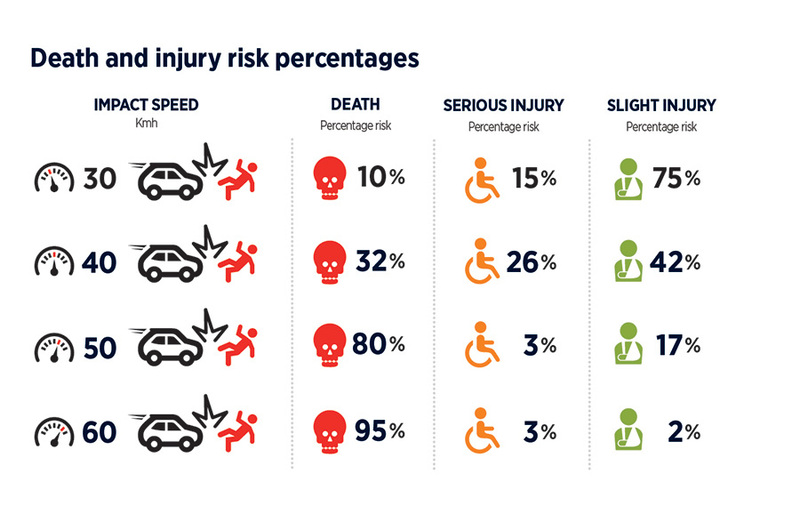 What’s more, vulnerable road users made up 43% of the deaths and serious injuries in urban areas. There are many things that can be done to help improve safety but one of the quickest, most effective and cheapest ways to do this is to lower speed limits. The speeds people travel at is a key determinant of how likely someone is to survive a crash, especially if they’re a vulnerable road user. the speeds involved are much more likely to be survivable – this is shown below. A month ago, Auckland Transport launched a consultation to change the speed limits on 700km of roads across the Auckland region. That may sound like a big number but it represents only about 10% of the entire road network in Auckland and about 90% of those are rural roads. While rural roads make up the bulk of the changes, perhaps the most visible and contested changes are those planned for the city centre where AT plan to lower speeds to 30km/h on most streets (blue) with a few, such as the shared spaces even lower (pink). The proposed changes are being particularly opposed by the AA, who say they support improving road safety but want to compromise with limits reduced only to 40km/h. They’ve also come under attack from mayoral hopefuls like John Tamihere who have deliberately misconstrued what is proposed. There are plenty of myths floating around about the changes. AT have made a few attempts to address the most common of these here and here. One of those myths is the impact on journey times, however in most cases, the changes will result in delays of only seconds at most. In the city centre this is likely to have even less of an impact as traffic at peak times often doesn’t move close to that fast but also AT plan to adjust the traffic light phasing to allow for ‘green waves’ on key corridors. One thing we also know is that where these changes have been implemented, they are successful with plenty of local and international examples to back them up. An aspect many in this debate forget is that city centre streets aren’t just about getting people from the motorway to their carpark as fast as possible. Auckland’s city centre has been changing dramatically in many ways in recent years and one of those has been an explosion in the city centre population with no over 57,000 people living in the area. They’re people who primarily get around the city by walking, cycling or scootering and who deserve to be able to do so safely. The excellent video below highlights many of the reasons why we should adopt lower speed limits. One of the things I like is that it’s not just about safety but also makes the point that slower speeds also benefit areas like air quality. At 5pm on Sunday the consultation ends and so if you haven’t made a submission yet, now’s the time to do it. As of Monday, AT had told me they’d received just under 8,000 submissions, although not all of those are individuals as some are from organisations such as schools and health boards, and so represent a lot more people. While I don’t know the numbers, we can also assume that a lot of those submissions will be from the AA and their members opposing the changes. The good news is AT have confirmed that the consultation isn’t just a beauty contest to see who can make the most submissions. But in our view, it is still important they get as many in support as possible. Submissions only need to take a few minutes. For some further reading, there have been a couple of really good articles on The Spinoff in recent days about the topic. We hugely support this bold move and applaud Auckland Transport on this vision for a safe and inclusive city that begins to prioritise the safety of residents and visitors walking, cycling and using transit, rather than just worrying about vehicle speeds and access. We are relieved to see a focus on the safety of our families and friends who all spend the vast majority of their time within the motorway ring. On top of that we are excited for the possibilities for our neighbourhood, with slower, quieter streets making life more pleasant for everyone. We think there is room for positive improvement though. Detail around some major arterials could use some work – Symonds, Quay, Hopetoun should all be 30kph for their entire length, with Hopetoun getting a special call-out for being a residential street that is currently treated like a motorway. It borders hundreds of homes, a park and a school. Schools! We don’t have one in the city. So instead, many of our kids cross Wellington Street overbridge From Union Street to Freemans Bay School and AGGS on Howe Street. We will be asking that both Wellington and Howe streets be included in the 30kph zone, as they connect to 30kph streets at each end and kids are important! It doesn’t make sense to have a road connecting two 30kph zones together be 50, especially when they pass by schools with high walking access. We are keen to see the future laneway circuit (Shares Spaces) all set to 10kph now, including the Britomart area around Takutai square. The risk is that these are built and remain at 30kph until the next round of bylaw updates and we end up in a situation where shared spaces have ambiguous and inconsistent speed limits. Federal Street between Wellesley and Mayoral/Cook will finish shortly after the changes are made and will be set at 30 for potentially several months and this seems silly to us! Finally, we’ll keep an ever present eye on air pollution and make sure that our air quality doesn’t get any worse as part of the changes. We understand that it should be better, but it’s such a huge concern for us that we’d be remiss not to mention it. Even if you don’t have specific feedback, we need your positive voices to drown out the negative ones and give AT the confidence to proceed with this hugely positive initiative. We’ve been told directly by the project team that this is not to be taken for granted, other groups are meeting with them directly also that have other agendas for the changes, so please please dont assume this will happen automatically. Thanks GA, survey done and forwarded on to many people. It’d be so good if they rolled this out city wide. My kids walk to school along Burns Ave in Takapuna, the oldest is 8 and little one is now 7 but they’ve only just started walking to school by themselves. I’d liked them to have been doing it 2 years ago but with the 50kmh speed limit it didn’t seem wise. Even now it still makes me nervous given how many superstar drivers think they can blast along Burns ave at 60km with primary school kids about, I wish the 30kmh limit was applied here and across the city. Hamilton Speed Management Plan – public consultation will commence on Monday 1 April 2019 and close on Friday 4 May 2019. It’s great they’re doing all the schools, although I’m not sure what kids are supposed to do before they get to the zone around the school. Do you think they’ll include Early Childhood Education centres when they say schools, Peter? This is step in the right direction. Let’s hope it’s followed by reducing speed limit on all the residential streets and local town centers/villages too. Yes, this raft of changes will show what’s possible. Hopefully bringing a safer speed environment to the whole city will be a quicker process after this. I congratulate AT for taking this step, and holding the line in the media regarding the importance of a 30kph limit in the city centre. As a frequent visitor to the CBD all my life, one can only describe the changes that have taken place as ‘transformational’. Some 60,000 people living in the CBD and 120,000 jobs. All manner of languages being spoken. Buskers and artists. Exciting new restaurants. Visitors from near and far. Bustling streets full of life and variety. Vive la difference! Auckland is clearly on its way to achieving its ambition of becoming a world city. However, the road environment of its city centre is equally clearly holding it back. The footpath on Queen St accommodates thousands of people, yet occupies only 25% of the road space, while a few large hunks of metal enjoy the remaining 75%. The situation is even worse on other streets such as Albert, where as you’ll see in the following example from Google Street View, pedestrians are forced into the carriageway due to lack of space on the footpath! This is far from an isolated incident in terms of time or location. Mid-block crossings throughout the city are either unavailable or too small. We must face the fact that vulnerable road users are routinely being forced into a highly dangerous environment. With the city centre population continuing to grow, we can expect this issue to grow non-linearly as new users attempt to use footpaths already at capacity. Mid-block Mayoral Dr is almost uniformly horrendous, with major pedestrian routes such as from the Grand Millennium Hotel to Aotea Sq, or Airedale St entirely uncatered for in a road environment that gives every indication to drivers of a 60kph+ design speed. 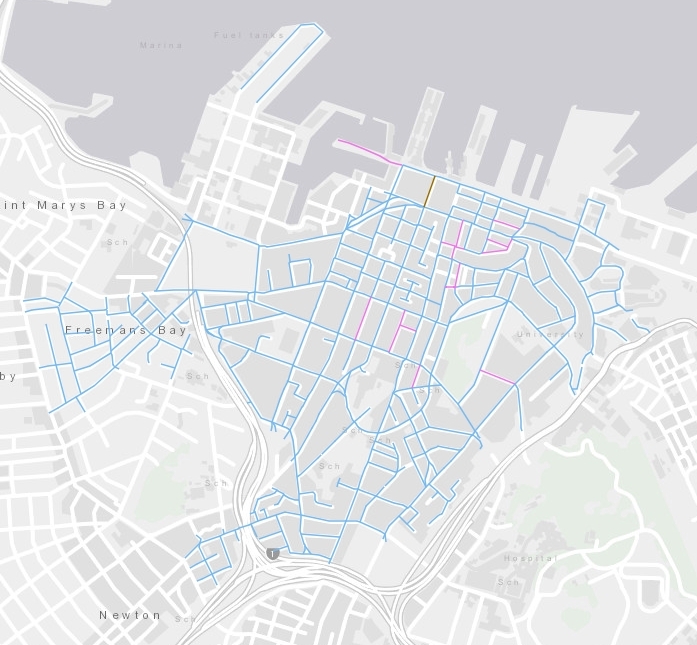 Between this and Beach Rd, Anzac Ave, Customs St, Hobson St, Nelson St, and Fanshawe St, the CBD is ringed with an entire network of virtually impassable multi-lane, high speed, manifestly unsafe, barriers between major destinations. Take Hobson St between Cook and Pitt St. A 300m section, designed effectively as an on-ramp to a motorway, complete with overhead signs. Cars travel at speed and change lanes suddenly. This might be appropriate for motorway interchange, but is instead in a location lined with hotels, workplaces, backpackers and tall apartment buildings. While no-one would recommend doing so, with no formal crossing for 300m, it is no surprise that some do decide to cross mid-block – taking their life in their hands as they do so. This issue can be examined through a number of lenses. Safety. Loss of amenity. Auckland’s reputation among visitors. Lost economic opportunity as people avoid certain parts of the city because they don’t feel comfortable (or indeed the CBD in general, though its far from the only place in Auckland that suffers such issues). Taken together, one is forced to the conclusion that the situation constitutes nothing short of a crisis. A population the size of Napier lives in the ~3sqkm city centre. A population the size of Dunedin works there. Add to this the huge numbers of visitors, for many of whom the Auckland CBD will form their first impressions of Aotearoa, and you have a population density on par with the centre of Paris. Yet despite these numbers and our ambitions, we have a city centre that is manifestly unsafe, unattractive, and uneconomic. Maybe the roads I’ve talked about made sense when they were first designed, but they clearly do not any longer. Major change is required. If we are to err in our decisions now, given the expected continuing growth of the city centre, it should be on the side of providing more safety, more amenity that might be required – not less. I am generally supportive of the proposals contained within Access for Auckland, and believe if these are carried out to a high standard that many of the problems I’ve highlighted will be addressed. However, even with every sense of urgency on the part of AT, these infrastructure changes will take time to implement. The crisis we’re in also requires immediate action. Lowering these speed limits is something that can be done now, to save lives and improve the quality of life of over 100,000 people, while contributing to our end goal. Consequently, I cannot recommend their adoption highly enough. My earnest hope is that this will be only the first tranche of changes made to unsafe city/town centres across Auckland.